I’m a girl who lives in Colorado, a place where we actually have all four season. And, yes, I’m a girl who loves all things fall: Layers, boots, football, curling up with a PSL and a good book. I’m cool with it! I’ve embraced the more basic things about myself. However, every year at the first chill in the morning, I throw away my sundresses and sandals with abandon, opting to sweat it out in knee-high boots and pea coats while the weather is still in the 80’s by noon. And without fail, I regret that decision every late winter, when my pea coat is in desperate need of a dry cleaning and I no longer view my boots as warm and cozy, choosing instead to refer to them as “foot prison”. It’s on those days that I would give all the pumpkin spice lattes in the galaxy for a warm, dry day when I can start to bust out my spring clothes yet again, just to repeat the same cycle. This year is going to be different. 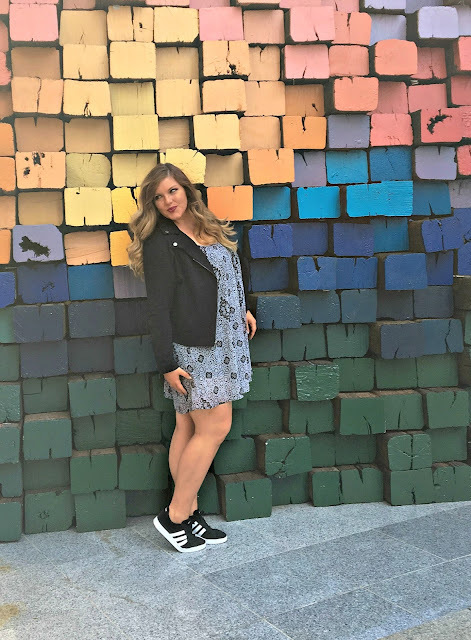 This year I pledge to ease into my fall wardrobe a couple pieces at a time instead of plunging face first into them like a puppy wearing a Halloween party hat and truly give my summer favorites a proper adieu in the process. Fall is all about layering, just like every instagram meme about the wonders of fall will tell you, and this notion is the crux of why a smooth transition into fall is so easy. Instead of stepping out in the shorts and tanks that ruled your summer days, try that same look with a long-line sweater over the top to add warmth for cold mornings and a little more visual interest. 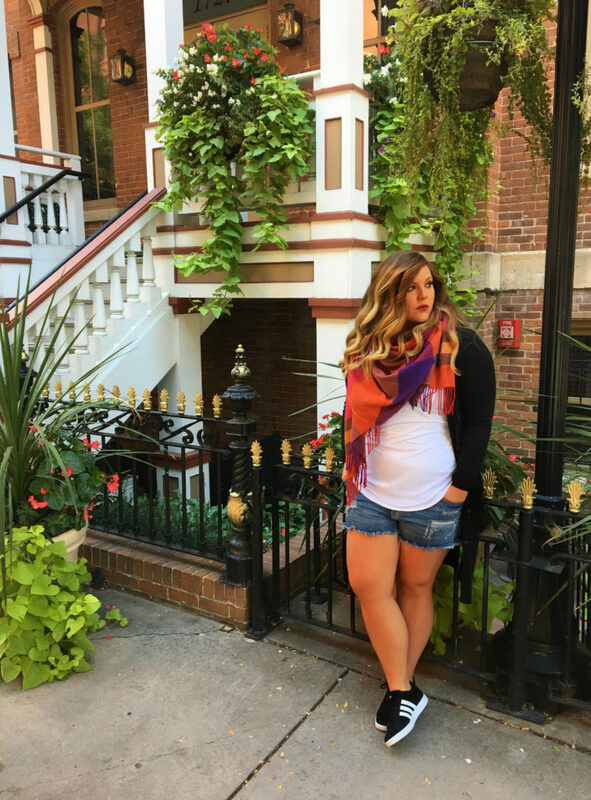 The beauty of transitioning from summer into fall is that so many of the looks we toss to the back of the closet on September 22 would actually still be perfect with a jacket or sweater tossed over the top. 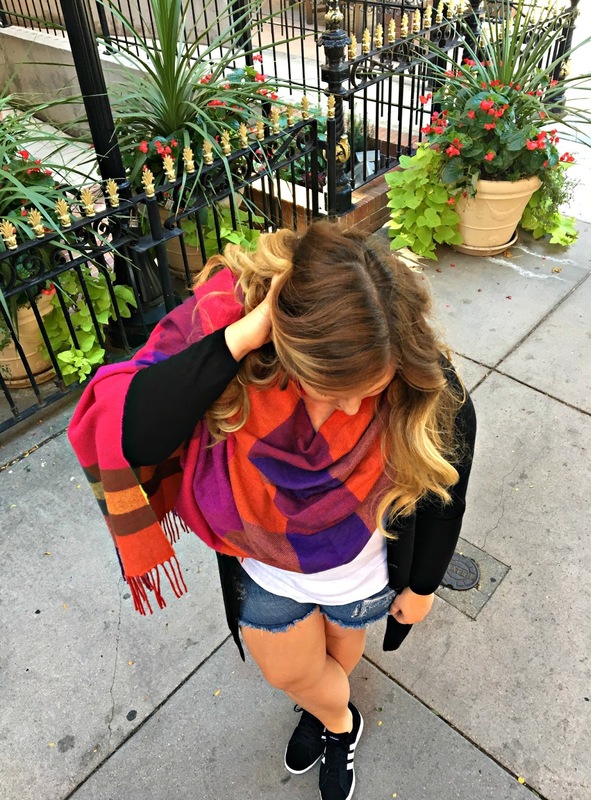 To add even more warmth and texture, add in a blanket scarf with a color palette that combines both seasons. Bonus points on the blanket scarf: it can act as an actual blanket on chilly rooftop patios if needed. As far as shoes go, repeat after me: “Step away from the riding boots!” However, the tough thing about fall is that the temperatures do fluctuate so much, so sandals are sometimes not the best option either for people like me whose feet seem to always run at a temperature nearing zero kelvin. I combat that by keeping my favorite sneakers at the front of the pack. I love channeling my middle-school self with some Adidas, which are (thank all the is good in the world) making a huge comeback this fall. As soon as the temperature drops, it is so tempting to break out every cute cold-weather item we own. However, with some creative styling, we can make our summer staples stretch just a little bit further.